Presents a fully interdisciplinary approach with a stronger emphasis on polymers and composites than traditional materials books Materials science and engineering is an interdisciplinary field involving the properties of matter and its applications to various areas of science and engineering. Polymer materials are often mixed with inorganic materials to enhance their mechanical, electrical, thermal, and physical properties. 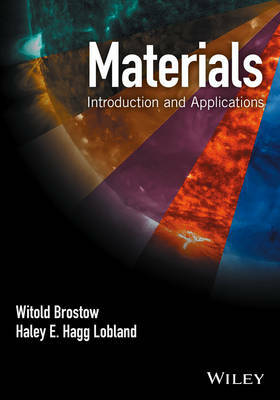 Materials: Introduction and Applications addresses a gap in the existing textbooks on materials science. This book focuses on three Units. The first, Foundations, includes basic materials topics from Intermolecular Forces and Thermodynamics and Phase Diagrams to Crystalline and Non-Crystalline Structures. The second Units, Materials, goes into the details of many materials including Metals, Ceramics, Organic Raw Materials, Polymers, Composites, Biomaterials, and Liquid Crystals and Smart Materials. The third and final unit details Behavior and Properties including Rheological, Mechanical, Thermophysical, Color and Optical, Electrical and Dielectric, Magnetic, Surface Behavior and Tribology, Materials, Environment and Sustainability, and Testing of Materials. Materials: Introduction and Applications features: * Basic and advanced Materials concepts * Interdisciplinary information that is otherwise scattered consolidated into one work * Links to everyday life application like electronics, airplanes, and dental materials Certain topics to be discussed in this textbook are more advanced. These will be presented in shaded gray boxes providing a two-level approach. Depending on whether you are a student of Mechanical Engineering, Electrical Engineering, Engineering Technology, MSE, Chemistry, Physics, etc., you can decide for yourself whether a topic presented on a more advanced level is not important for you or else essential for you given your professional profile Witold Brostow is Regents Professor of Materials Science and Engineering at the University of North Texas. He is President of the International Council on Materials Education and President of the Scientific Committee of the POLYCHAR World Forum on Advanced Material (42 member countries). He has three honorary doctorates and is a Member of the European Academy of Sciences, Member of the National Academy of Sciences of Mexico, Foreign Member of the National Academy of Engineering of Georgia in Tbilisi and Fellow of the Royal Society of Chemistry in London. His publications have been cited more than 7200 times. Haley Hagg Lobland is the Associate Director of LAPOM at the University of North Texas. She is a Member of the POLYCHAR Scientific Committeee. She has received awards for her research presented at conferences in: Buzios, Rio de Janeiro, Brazil; NIST, Frederick, Maryland; Rouen, France; and Lviv, Ukraine. She has lectured in a number of countries including Poland and Spain. Her publications include joint ones with colleagues in Egypt, Georgia, Germany, India, Israel, Mexico, Poland, Turkey and United Kingdom.